Hockey trivia king Don Weekes is back with another action packed trivia book. Jaw Dropping Hockey Trivia the latest title from Weekes, who has released more than twenty books on hockey now. Hockey drama ripped from the latest headlines. Awesome achievements immortalized in the record books. The exploits of superstar greats from Alex Ovechkin to Gordie Howe. 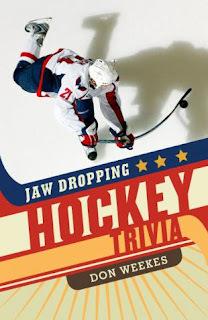 This explosive trivia collection will test the knowledge and stoke the passion of hockey fans everywhere. Hockey trivia maverick Don Weekes takes the reader on a colourful journey through hockey lore and legend. Eight must-read chapters of multiple-choice Q and ;A and seven thrilling games and quizzes cover every angle of the sport, including the wild 2011 Boston-Vancouver Stanley Cup final and the on-ice thrills at the 2010 Olympic Games. From great victories to notorious hits to uproarious interview quotes, the world's most exciting sport is crammed, in all of its zany glory, into one jaw dropping trivia package.